Triple Crown Odds? I’ll Have Another! Where do horses that won the Derby and Preakness usually place in the Belmont Stakes? What are the odds that no horse has won the triple crown since 1978? What is the best horse name of all time? Ok, well I can use Minitab to answer those first 3. As for the last question, well, let’s not get ahead of ourselves. There is some data analysis to be done before we get to the best horse name ever. But I promise, it’ll be worth the wait! First, we must decide what year to start collecting data. The first year all 3 races were run was 1875. However, the Kentucky Derby didn’t really prosper as a race until after the turn of the century. There were 5 different horses before 1900 that won both the Preakness and Belmont Stakes that didn’t even run in the Derby. And in 1905, only 3 horses participated in the Derby. So it’s hard to determine when a horse actually had a chance at the Triple Crown. I’ll start with 1910, because it gives us an even 100 years of races (there were 2 years after 1910 where the Belmont Stakes were not run, so I left those years out). If you want to follow along, you can get the data here. Ok, so what was our first question again? Oh yes, how often do horses win both the Derby and Preakness? Since 1910, about one third of the Kentucky Derby winners have gone on to also win the Preakness. That’s more often than I would have guessed! So this year really isn’t that rare. Ok, so how did those horses make out in the Belmont Stakes? We see that 11 times the horse has gone on to win the Triple Crown. And even when they didn’t win, they were often either second or third. So even if I’ll Have Another doesn’t win the Belmont, he’ll more than likely finish in the top 3! 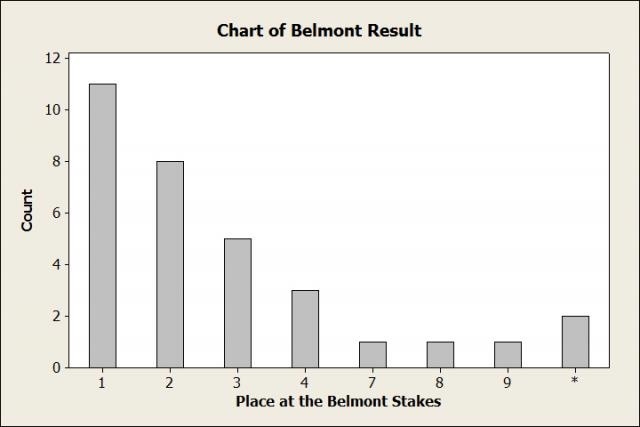 And in case you’re wondering why there is a category called “*”: in the 1930s there were two years where the horse did not run the Belmont after winning the Derby and Preakness. So I entered a missing value symbol for those two horses. Ok, time for question #3! What is the probability that no horse has won the Triple Crown since 1978? To answer this one I’m going to have us time travel back to 1978. Affirmed has just become the 3rd horse in 6 years to win the Triple Crown. We go and tell a statistician that no other horse will win for the next 33 years. After doing some quick calculations, he laughs at us. Here is why. (1 – 0.164)^33 = 0.0027 = 0.27% = 372 to 1! (1 – 0.579)^11 = 0.0000736 = 0.00736% = 13,580 to 1!!!!!!! Wow! That’s worse odds than the 2011 Red Sox Collapse! We jump into our time machine and return to present day. Wait, we had a time machine, knew the results of 33 years of Triple Crown races, and didn’t make any bets?!?!? Oops. Anyway, we do need to keep in mind that we based our probability off of a small sample of 19 races. Our probability of 57.9% could be too high. Or maybe the probability isn’t the same nowadays. I’m not a horse racing expert, but the quantity of fast horses could have increased in the last 30 years, making it much more difficult for one horse to dominate. However, there is a stat that doesn’t quite support that idea. This is the proportion of Kentucky Derby winners that went on to win the Preakness before 1978 and after 1978. You’ll notice that the proportions are almost exactly the same. 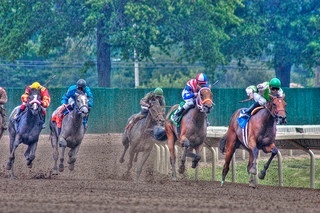 So winners of the Derby are performing exactly the same in the Preakness for both eras! But for some reason, it seems that horses after 1978 are just getting unlucky in the Belmont Stakes. I’d say we’re due. Another Triple Crown? Why yes please, I’ll Have Another! And last but not least, here is the greatest horse name ever. The video is 90 seconds long. It starts out a little slow, but trust me, watch the entire thing. You can thank me later. Photograph by Greg Molyneux. Images licensed under Creative Commons Attribution-NonCommercial 3.0.